It was a bit of a drizzly November afternoon in New Orleans, but the weather cleared up just in time for this Texas couple's wedding in the French Quarter. The ceremony and reception were to take place in the main courtyard of the Maison Dupuy Hotel on Toulouse Street, but we started out with a first look in the smaller and more secluded back courtyard, by the hotel's carriage house room. 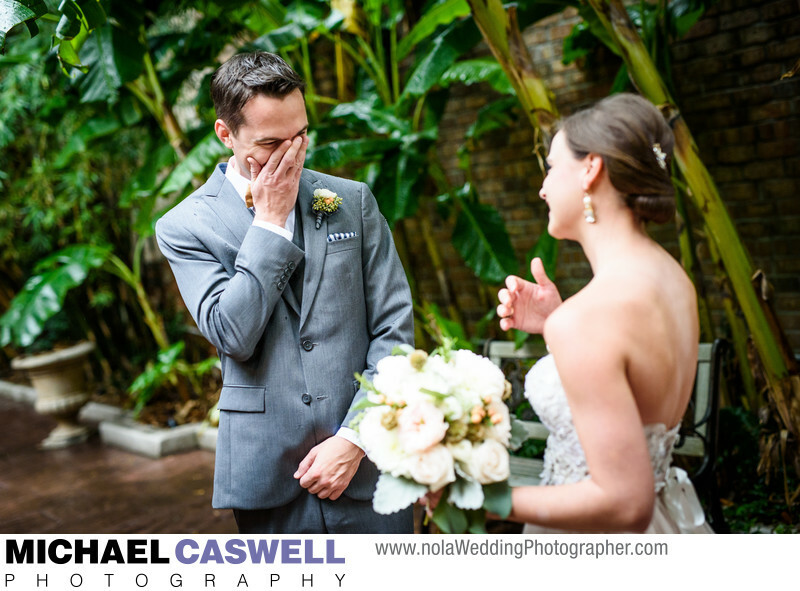 In this sweet moment, the groom struggled to contain his emotions upon seeing his beautiful bride for the first time on their wedding day. This kind of genuine reaction cannot be duplicated or created on demand, and is one of the main reasons why I love photographing first looks. In addition to their wonderful wedding at the Maison Dupuy, I also had the pleasure of photographing this couple a few years later on an anniversary trip to New Orleans, this time accompanied by their recently born baby girl! Location: 1001 Toulouse St, New Orleans, LA 70112.